Did you know that 1 in every 4 Americans experiences chronic back pain? With many of us now spending our days sitting at a computer, even more of us are suffering from back pain, leading many of us to spend hundreds of dollars a year on pain relief products. Most of these products are built on a one-size-fits-all model and don't deal with the overall issue - supporting the lower back. To properly deal with pain and relieve muscle fatigue, you need a product that contours to and supports the lower back. 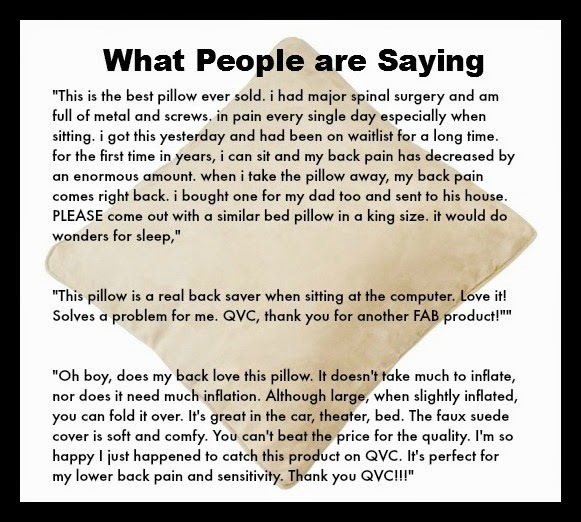 Luckily, there is a product on the market that does just that - the QiPillow! What is so unique about this pillow? Unlike other orthopedic pillows, the QiPillow contours to the lower back using its own unique air-controlled orthopedic core. By inflating and deflating the pillow, it can adjust to the contours of your back, and lessen or eliminate muscle fatigue and back pain. Since it can be completely deflated, it can easily be folded and thrown in a bag, allowing you to use it at home, in the office, or even while driving. The QiPillow had great results in independent clinical studies, which showed that the QiPillow helped 91% of users improve sitting comfort and posture while relieving back pain, stiffness, and fatigue. With the QiPillow, you can take control of your back pain, allowing you to relax and enjoy the things you love! Would you love to learn more about the QiPillow? Due to popular demand, the QiPillow is coming back to QVC on April 15! Join host Jaque Gonzales and the inventor of the Qipillow, Patrick Lee, as they discuss this revolutionary pillow and how it can help you. You may even find this pillow even cheaper than its recommended price of $49.95! So mark your calendar and make sure to check out the QiPillow on QVC's Active Aging on April 15 between 1 - 2 PM ET! To celebrate the QiPillow returning to QVC, Mom Powered Media is excited to be working with QiPillow on this awesome giveaway! 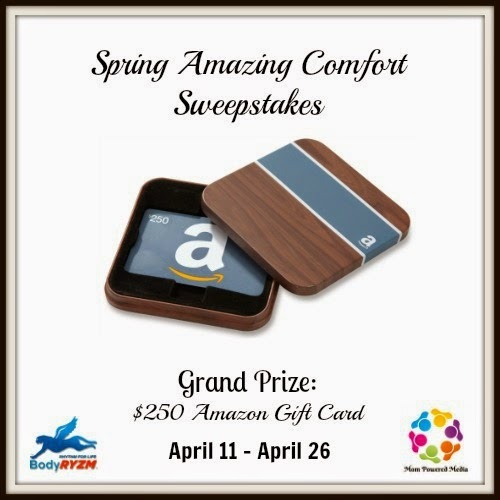 One lucky reader will win a $250 Amazon Gift Card. Sweepstakes ends April 26th at 11:59pm ET. Mom Powered Media & associated bloggers are not responsible for prize fulfillment. Would you like to have your products featured in a giveaway event? Want to increase your social media exposure? See how Mom Powered Media can help! Contact susan.l.bewley@gmail.com to see what we can do for your company! I learned this pillow has a removable cover. It can be a "throw pillow" on your sofa and a support at a desk chair or arm chair. I learned it has a valve for adjustments. This pillow can be used in any room of your home or even the car. I learned it's an awesme pillow it can be used in many places and situations and looks comfortable, has good adjusting controls.